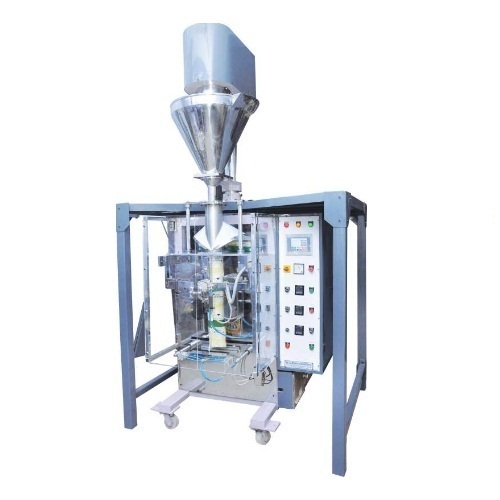 Automatic Vertical Form Fill Seal Machines (Collar type) with Auger filler (Servo / Clutch brake control) is used to pack Powder as Spices, Milk Powder, Coffee powder, Flour, Maida, Besan, Chemicals and Pesticides etc. Contact Parts All contact parts of the machine are made of Stainless Steel. Sealing Type Center seal, Intermittent Type. Film Type Heat sealable, Pet Poly. Packing Range Up to 10 Kgs. (Depends upon product density). Electric Control By PLC with touch screen HMI. Temp. Controller PID control, Digital 45 x 45 mm. Photocell Unit For accurate pouch length. Paper Pulling By Pulling belts & Pneumatic Pressure. Compressed Air 3-4 CFM at 10 kg. /sq.cm. is required. Power Required Three phase, 440 VAC, 50 Hz, 5 kW. Optional Attachment Batch coding device (Hot foil ribbon type).